Rheumatoid arthritis can affect any of the moveable joints (synovial joints) within the human body, including joints directly responsible for movements of the spine. When RA affects the back, symptoms can range from mild to severe enough to require spine surgery to relieve pressure caused by the swelling and inflammation of joints that’s characteristic of this type of arthritis. Rheumatoid arthritis in the back often results in pain that radiates to nearby areas, including the neck, legs, shoulders and arms. While there is no cure for rheumatoid arthritis, certain medications (NSAIDs, steroids and antirheumatic drugs) can help reduce inflammation and slow the progression of the condition. The majority of patients with rheumatoid arthritis respond well to nonsurgical treatments, often including a combination of physical therapy, medications and a change in diet. Some patients respond well to alternative therapies, such as mediation, yoga and breathing exercises. In severe cases, or when RA has progressed significantly, patients may require surgeries that can include total joint replacement or joint fusion of the spine. To learn more about your treatment options for RA of the back or spine, call 310-828-7757 and schedule an in-person consultation with one of our experienced board-certified spine physicians in Santa Monica. 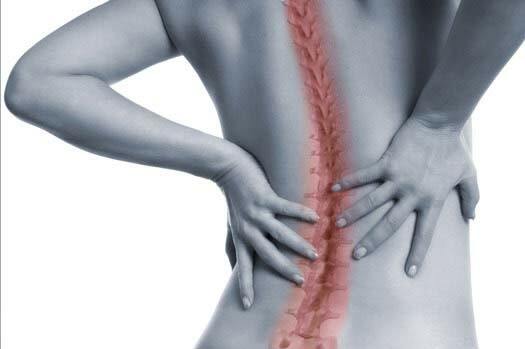 The Spine Institute Center for Spinal Restoration is here to help.